c'est la vie: Lessons from Kung Fu Panda 2 ! Lessons from Kung Fu Panda 2 ! 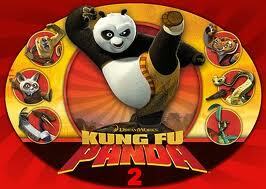 In KFP, Po becomes the dragon warrior by defeating Tai Long and saves the village. In KFP2, the Peacocks, (emperors of Ancient China) have a son, Shen who resorts to violence for getting power; due to which he is banished from the kingdom. In turn, he builds cannon and uses it to get back his kingdom from the Kung Fu Master’s Council. Hence, Chi Fu sends his students to go and stop Shen. Check out the movie to know how the story goes ahead… With the outline set, let’s go ahead with the lessons. Never ending Knowledge: There is a proverb. ‘Known is a drop, unknown is ocean’. This emphasizes that a person learning never stops. ShiFu demonstrates a skill at the start of the movie and says that “for a Master, it is the next phase of the training”. Even for a Master, there are skills to be learnt, potential unearthed, and that the journey for Knowledge goes on. It is never ending… The moment someone says that he has mastered all, that’s when the downfall begins. Inner peace: I guess this will be quite hard for many to understand (Even Iam wondering about it still), but attaining Inner Peace, is a pit stop before becoming Enlightened. Chi Fu says ‘Anything is possible, when one has inner peace’. And from the movie, I decipher that finding the purpose of one’s life is a means to attain inner peace. Secret of Team Success: This is more of a management lesson. For any team to succeed, it is necessary that the members of the team work to each other skill’s advantage. No one is better or bad. Each brings on value add based on circumstances. This is clearly illustrated by the fact that the Furious five and the dragon warrior complement each other and leverage their skills. There is no ego between them and mutual respect and understanding exist. A team success is dependent on the success of the individual team members. Know thyself: When Tigress and Po have a sparring session, Tigress tells Po that she used to punch the Iron wood trees while practicing, and now she doesn’t feel anything. Po asks for a shortcut so that he too doesn’t feel anything like Tigress, for which she replies that “Hard style isn’t your thing”. It is apt to quote Sun Tzu wise words “Know thyself and you can win hundred’s of battle”. Each of us has our own strengths. Most often, we try imitating someone or try to be someone else, hoping to achieve their success. Sadly that doesn’t work out. What might have made other man succeed can’t help you succeed. Hence, the foremost task for a person is to know himself, his style, his way of working etc.. That’s what differentiates him from the rest and makes him/her unique. Facing fears: Another aspect which I would like to discuss is, regarding facing one’s darkest fears. We try to run away from our fear, thinking that will make the fear disappear. But the truth is that as long as we keep running away from it, it becomes that much stronger. As someone said, FEAR is nothing but, ….In the movie, Po refers to his nightmares as bad memories and tries to block it. 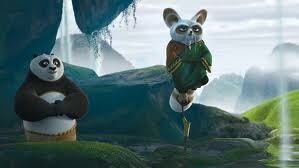 But the soothsayer tells him to “Stop fighting, let it flow” and when Po embraces his fears, he achieves Inner peace. In real life, it may not be that easy to achieve Inner Peace, but embracing one’s darkest fear will certainly help to let go of the fear and understand oneself. You are what you choose to be: This is my favorite lesson from the movie. These soothsayer lines are simply wonderful. “Your story may not have such a happy beginning. But that doesn’t make you who you are. It is the rest of the story, who you CHOOSE to be”, that makes you who you are. We are faced with innumerable challenges, obstacles in our daily life. Sometimes, it is very easy to pass the blame and wash off our hands. Telling reasons like “I didn’t have a happy childhood, I didn’t have a good schooling, I didn’t have money given to me by my parents” etc, may make us think that we aren’t responsible for our life troubles. But we forget that by doing so, we choose to be not-responsible for our lives. Every moment, we have a choice and the choices we make determine who we become. It determines “WHO WE ARE”. And that in turn, determines our DESTINY. Another Lesson is that sometimes you have to sacrifice. It was EXTREMELY hard for Po's mother to leave him in the box and keep running and create a diversion so that the wolves follow her and not get her son Po. For a lot of people, leaving their children is one of the hardest things to do. People who join the military have to leave their family. Some people leave their family to come to America and make money to send back to their family. My girlfriend (baby mama) is actually currently experiencing the same situation. Where I have to move back home with the kids and leave her here. We (me and my kids) have to move back home (MD) for a few months so we can save money, make money, and then come back here (CA). It is EXTREMELY hard but its the best thing for us right now. Po became stronger and just because he was separated from his parents doesn't mean that things are going downhill. Sometimes we have to let go of things or people that we care about and love the most. One of the hardest things to do.. but it will be ok.
We just watched the movie. 5 times better than the original. I found this entry because I was googling lessons learned in KFP2. There's a lesson I got out of it that I wanted to share to my girlfriend but can't remember what it was. Wasn't on here either... hmmm. Kung Fu Panda I was the first movie I saw in my cell phone, and I loved it! I never even knew that a sequel has come for that movie. I will watch it now, as you say its good. Taking complete responsibility that happens everything in our lives makes us great. But taking responsibility for everything that happens in the lives of the people around us too makes us a great leader! @Illuminator: Precisely :) That's the feel good factor after watching the movie ! Lovely post though. I could definitely read it.